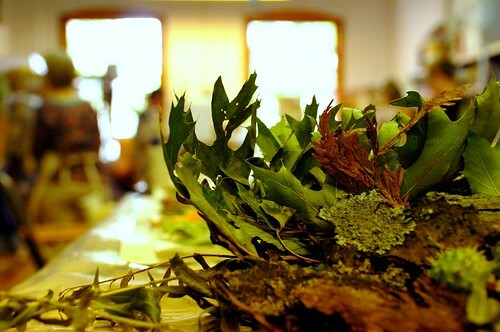 A couple weeks ago, I had the honour of joining a week long workshop at the Contemporary Textile Studio Co-op with Australian textile artist, India Flint. India is world renowned for the magic she has created with natural dyes and her unique approach to imparting colour and foliage prints to textiles and paper. 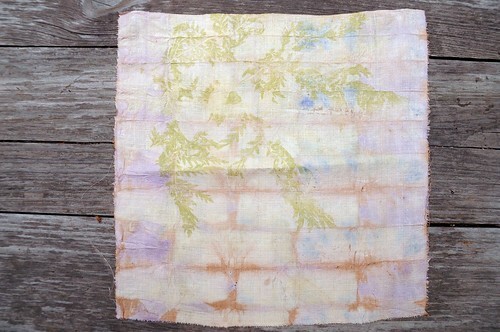 Since taking our natural dyeing class last year, I’ve been wanting to do more, (I think about it all the time!) but somehow haven’t gotten around to it. Silly how that happens. The opportunity to spend a whole week playing with plants and fabric with India at the helm was just perfect. We spent our days learning India’s gentle ways of collecting nature materials from florist or grocer garbage (with permission), going on windfall walks (collecting only what has fallen on the ground and not harvesting), learning about local weeds (plants that are in excess for picking) and looking in our own backyards. Even her mordants are made of milk (soy or cow), found scrap metals, pickle juice and aluminum foil from chocolate bars rather than hard and caustic metals. 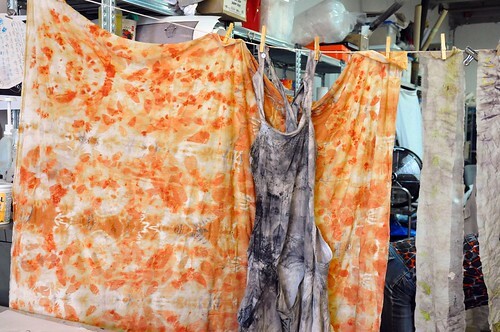 India’s approach to dyeing was very freeing. We didn’t use a scale, a thermometer or a ‘recipe’ of any sort. We were encouraged to work on small samples (rather than dyeing 3 metres at once), mostly using silk and wool (protein fibres which take colour much more vibrantly). We lay our plant material directly on the fabric and then wrapped or folded it into tight bundles with elastic and string. We had several dye pots on the go, one with onion skins, one with iron scraps, one with who-knows-what. 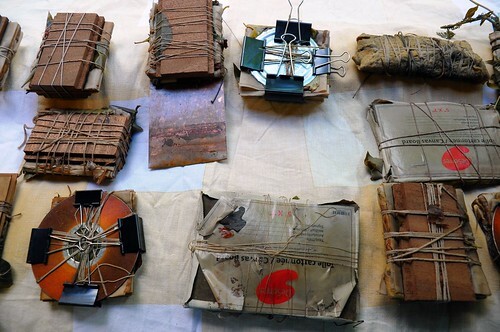 We would sometimes leave the bundles overnight and arrive in the morning to unwrap our treasures. The imprints we each got were truly remarkable. What a beautiful way to mark fabric. 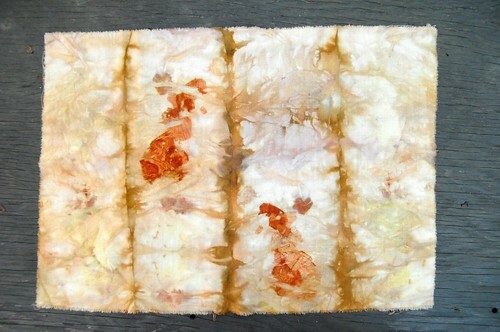 We used the same process to dye paper that we had hand stitched to create a little book. Each student also spent the week deconstructing a men’s shirt to make a special work apron, which we also dyed and hand stitched our samples to. 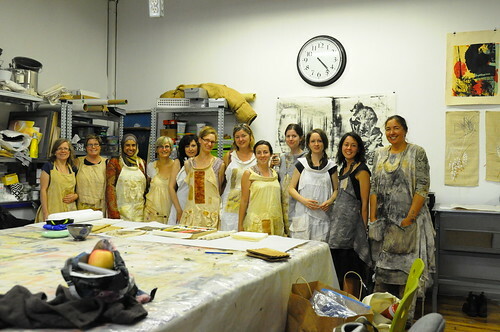 At the end of the week, we took a group photo wearing our aprons. So cute! On the last day we gathered up all our favourite samples and took some time to admire each other’s work. 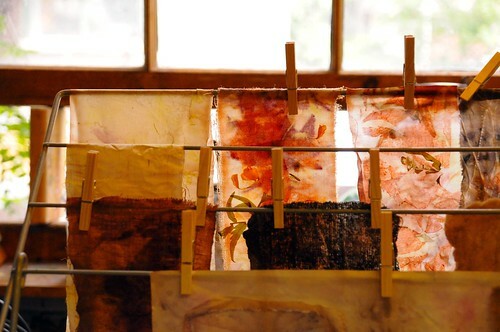 It was amazing to see how much of our personalities was present in our dyeing samples. Such diverse results from working with mostly the same materials. I’ve been reflecting on the experience ever since with much wonder. Thank you, India! I took tons of photos during the week and I’ve posted them all on flickr here. i so wanted to not go to work and join in this workshop. 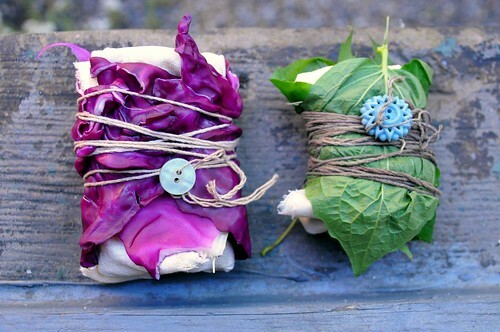 your little plant material fabric parcels make me smile. These photos make me seriously regret not giving the class greater consideration! Ack! Wow, Karyn, that sounds like an amazing experience!! Those are some seriously beautiful pieces of fabric art! Wow! this looks like so much fun! the results are absolutely gorgeous! These photos are really inspiring. Thanks for sharing them! Just wondering. do you cook the bundles? Or just leave them in water? thank you for all the kind words – and your photographs are fantastic. Reading with smiles. 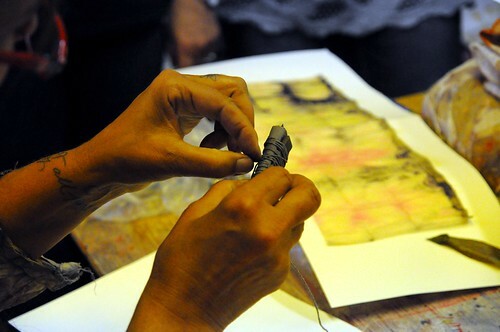 Your lovely photographs captured the essence of the workshop. I had the great fortune of attending her workshop in Tennessee, USA prior to your week. Did all the participants make those aprons? I want one! this is a delightful and perceptive description of what i just slightly experienced on attending india’s lecture. i wish i could have been one of your group! well done, both your reporting and photographs. i especially love the pic of india’s hands. great photos. I am an India fan. I hope to take her work shop one day.